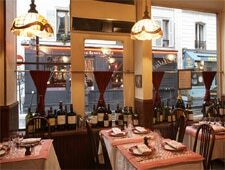 Astier draws locals and tourists alike with its classic dishes and lively scene. : Astier has been in operation since 1956, and it pioneered the "cuisine bistrotière" created by Mr. Astier. Décor and the cuisine draw as many locals as tourists --- basically anyone who is fond of "plats canaille" and the classics. Mathieu Le Tirrand and his sound team have been trained by seasoned chefs. In this lively space, they regale patrons with marinated smoked herrings, pommes ratte en vinaigrette, tête de veau pâté with sauce ravigote, braised ham hock and roasted leg of lamb. The wine list is impressive and is partly responsible for the restaurant's success. This establishment cares for its clients and the terroir.